Like I wrote in the reportage from the High End 2011 (you can read it in this issue), this year’s show was special. For me most important was the crossing of the psychological barrier of fear for audio files – almost everyone used them. But below it a completely different story pulsated. A History even, with a capital ‘H’ – the 30th anniversary of the show. Starting as a small event, dedicated to absolute madmen, it soon became a well managed event, know worldwide, taking the reign over many other shows, including the Berlin IFA. There were many reasons for that, but I think, that it mostly due to the abdication of Berlin – there were the most important premieres in the audio world, and ten years ago there were all the people having anything to say in that area. But the IFA converted in to a home appliance show, focused on all products related to home use, and the specialists, including the audio ones, found other communication channels. And frankly speaking, the High End of today looks exactly the same as the audio part of IFA a dozen years ago. Does this mean, that there is now time for other, smaller shows, where the ‘madmen’ of today will find their place? Who knows, there is high probability that it will end this way, that now there is a successor of the High End growing quietly, even if nothing is indicating this. In the end history likes to repeat itself, and the cycles are its immanent characteristics. Each of the cycles is of course a little different, it learns from the experiences of its predecessors, but the mechanisms stay the same. Wojciech Pacuła: Do you remember your first High End show? 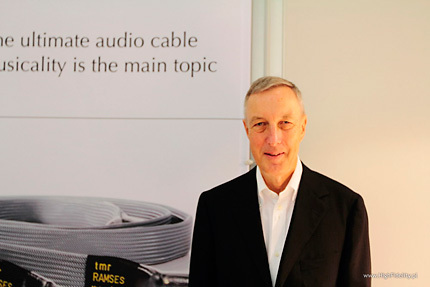 Kurt W. Hecker: I still think fondly of the beginning in 1982, when twelve manufacturers and distributors from our branch got together for the first time under one roof in a hotel to present high-end equipment, which was at the same time as the large audio exhibition in Düsseldorf. As a consequence, the exhibition was viewed with such success by all the participants that today's HIGH END SOCIETY was founded the following year as an association of manufacturers and distributors of high-quality consumer electronics and the HIGH END was well on the way to becoming an annual trade fair in the industry. WP: What did you do there? KH: I was also an exhibitor of the first HIGH END show with my product line of that time. How do you feel about 30th Anniversary - what kind of show it is, what people, brands etc. 1982 saw the launch of our HIGH END exhibition and today in 2011, I look back with great pride and joy on 30 years of HIGH END show, in which I have had the pleasure of accompanying the HIGH END personally since its inception, right up to now. Over the course of 21 years, I have seen the HIGH END as a hotel exhibition at Hotel Kempinski in Gravenbruch near Frankfurt am Main - advance on its way to become the leading trade fair for the high-end industry in the world. Despite the very legitimate concerns at the time, today I am extremely pleased that we found some years ago the ideal conditions for our trade fair with the new location in M,O,C, in Munich, once the exhibition had outgrown itself as one that took place in a hotel. .
WP: What changed in our industry for 30 last years? KH: There is no doubt that the market and the industry have changed over the course of time. At the beginning, the only focus was on analog technology in the form of records and tapes as audio media. Later came digital audio media, such as CDs and DVDs, and today audio and image information is increasingly stored centrally on hard drives and can be played anytime all over the flat or throughout the house via network players. But the HIGH END has stayed young through all these years. It has always been open to changing conditions and has adapted its concept to the benefit of the exhibition. The development of what was originally a domestic event into an international trade fair has been an integral part of its increasing success over the years. Today the HIGH END is unquestionably, the ultimate, leading exhibition in the world for our branch and the most important annual meeting in the industry. WP: What new products did you show on 2011 High End? KH: On the HIGH END 2011 - beside of the highly reputated RAMSES-II cables - I present for the first time the DMA 03 sound modul from Switzerland to the international markets. The DMA 03 sound modul is the audiophile core component of a computer-based high-end audio system and responsible for the unique sound quality of such a system. It combines the best in cutting-edge D/A converter technology with a specially designed analog preamplifier of the highest quality. WP: What is the most significant new technology last years? KH: A remarkable tendency is the synergy of high-end analog audio and digital mainstream power. A multitude of clever solutions are around today which all use computers as a basis, such as streaming clients, multi-room systems or closed all-in-one solutions. As increasingly more internet platforms are emerging for downloading lossless digital music, the physical medium for digital data such as CDs, DVDs, SACDs and blu-ray is being constantly challenged. WP: What are problems behind the show? KH: Fortunately, actually I can see no problems behind the show. We found the right place with the M,O,C, in Munich, we have still space to expand the show if necessary and we see an ever-increasing international acceptance of our show. WP: How it will be evolve? I have no doubt at all that the HIGH END show, will continue in the future to occupy the position of the world’s leading special-interest show for high quality consumer electronics. We as the organizer of the show will always continue to monitor the future market conditions and we will also continuously consider the needs of the exhibitors. And if there will be any reason to modify the conception of the show we will do this carefully in an evolutionary way, but never in the sense of a revolution. Fabio Camorani: Yes, I do with joy, and it was in Munich, in 2005. It was my first high level audio show as manufacturer. I remember a great success for me and a good feeling in general. WP: What product did you show there? FC: The DC-1 zero-oversampling audio d/a converter in its first version and the PM-1 phono preamplifier for the AudioNemesis brand, just High Density Graphite accessories for turntables for AudioNautes. And for the first time in Europe the two basic driver models from Goto Unit. WP: How your products changed from that time up? FC: I don't like to change products very often. Generally if this happens it's usually due to mistakes of many kinds. I don't follow trends that much. For these reasons my products stay on the market for a reasonable long time. This is also important for the customer because he can recognize a greater value. So, DC-1 remained the same till 2009 when it has been discontinued. But since 2008 an improved version (named Upgrade Edition) has been available and it's still on the market! PM-1, instead, remained on the market till the beginning of 2011! Now an Upgrade Edition is available, for the same price! And the DC-1 VLE has been produced and sold in a short time, due to its incredible quality. In general, what I see now is a clear demand for many input solutions. This is why I needed (and need) to add more inputs to my products. Despite this stable catalogue, improvement is never ending and I always improve my products in my lab. When many steps are ready, a new version is published. FC: I may answer: everything. I'm an analogist and I see an increase in LP demands every year ( I also published my first LP in 2010!). But digital music allowed reasonable quality at low price. LP was dead, now is more than alive. CD was dead and now... still alive (and will remain alive for a long time I think). The very important aspect is that every step lowered the average quality of music reproduction. Many high cost products now available are not better than older ones. We don't have enough memory, maybe... I see that companies (especially big ones) cut product costs simply using cheaper technology, cheaper manning, no development and research but more and more expensive cases. They are loosing wisdom. Maybe they are not open minded, but only margin oriented. These issues bring us in a long discussion we need to face in another chance. But I'm confident that time will always give us the truth. 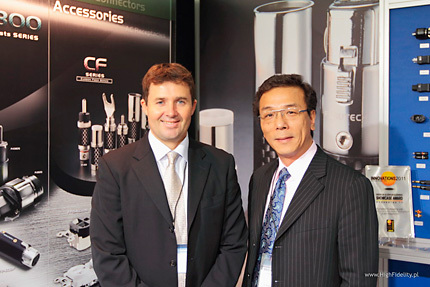 FC: Since 2010 I'm doing a very big effort to introduce many new products in a reasonable time. Now I'm on the way, the journey is not completed (maybe 40%) but I'm able to offer something brand new. I am proud to say that I presented the new level of AudioNemesis products. This level is represented by a brand new aluminum chassis that will be used for some new appliances. This chassis is precision machined from a single block of aluminum: really unusual in this range of products. The first two products using this chassis will be the already announced Echidna RS Class A mono power amplifier (presented in a prototype form in 2010), and the DC-32 32bit d/a converter (using ESS9018) which will surprise you (hopefully soon); but even more products. We wanted to present also the very first AudioNemesis loudspeaker! But we are late because we want to do something really outperforming the competitors. It's a 3way system, with 12" woofer, D'Appolito configuration and a ribbon tweeter, for more than 93db! W: What is the most significant new technology last years? FC: I think streaming is now considered the (near) future. I put an USB input in my DC-1 VLE, and the DC-32 will have a 24-192 USB input. Everyone is now asking for a USB connector, no matter if used or not. I have my own Music reproduction standard, but I cannot ignore customers inputs, even if the High End Audio market is not a standard one, and usual models (for market) cannot be easily applied. Despite what I read since early '80, still a lot can be done to improve sound reproduction quality. Every day I discover something, improvement is never ending. And this is the greatest fun for me, the daily challenge. Rainer Reddemann: Not in detail, because I have visited nearly all High Ends except the two first ones and 1996 - and I was there every time as an exhibitor. You know, I was the audio engineer for the company Restek between 1982 and 1996. I have developed several amps and active loudspeakers for them and we have displayed all that devices every year at the high end show, at that time in Frankfurt. Since summer 1996 we (Ralf Kolmsee and I) have formed our own company and already 1997 we are present at the High End with our new brand TRIGON. Every High End was a big experience for me. In the past (in Frankfurt) the show was a hotel fair and I like it very much, because it was more like at home. The room acoustics are closer to the real world at home, even though the acoustics are never quit well at an exhibition, but that normal and the most visitors know this. The show in Munich is bigger but the feeling is more like an industrial exhibition. RR: We have displayed the complete equipment of that time, amplifiers, tuners, active speakers and the first CD-player. RR: The audio market has completed changed against the early 80th. At that time there are only a little amount of different devices in the audio section. Apart of amplifiers and speakers or head phones you have had only a little amount of source devices. There exist only turntables, FM-tuners and tape recorders. Today we have so many different devices. Amplifiers in all kind of analog technologies and in different digital technologies, radio receiver in analog, digital via satellite or DAB or digital via internet, multy channel systems and surround equipment up to 10 channels, different CD-players, many different digital equipment like streamer, hard disc recorder (ripper) or MP3-player, and, and - and computer and the internet. It is impossible to offer all kind of equipment for a little company like we are. We only have a chance if we are focused our efforts to a small amount of audio equipment. Step by step we go forward to capture new technologies, but it is not easy today. In the past high end audio was often a well done trade but meanwhile it is high grade technology and it is necessary to have many different engineers. Today you need at least an electronic specialists for the hardware but it is also important to have software engineers. Small companies have to work very hard to survive. The complete market is developing very fast. WP: How do you feel about 30th Anniversary – what kind of show it is, what people, brands etc. RR: We are proud to be there and to be a part of the scene. I am sure we are not every body’s darling but we have several customers who like our devices and we hope we can satisfy them in future, too. Nevertheless we try to introduce our devices to some new customers and I hope we can convince many people about the quality of our products. 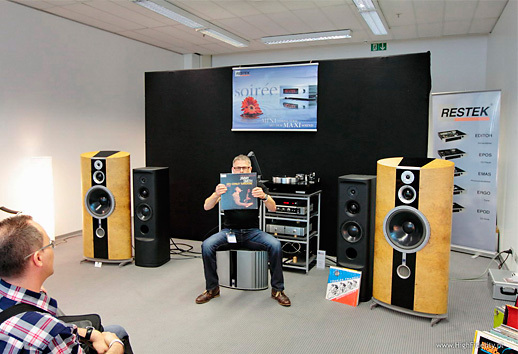 The High End Munich is now one of the famous audio fairs of the world. It is a mirror of all kind of excellent home audio equipment you can buy. A little bit sad is that the price range seems to be open end. I am not a friend of super high end audio for super high end money. It warped the view of the point which is “enough” HiFi. Music and its reproduction at home is the main target and if you only be satisfied with equipment over 250000 Euro, then there must be something wrong. If you spend so much money, please travel to the place where your favourite musicians are playing, buy a ticket and enjoy the life concert. RR: Like I have described under #3. Meanwhile the audio world is more digital than it was 5 years ago. We have parallel (audio) worlds. Tube equipment with it special sound, analog semiconductor devices (mainstream) but more and more digital audio (IT generation and everything has a display or TV on board). RR: A ripping hard disc streamer (named CHRONOLOG), a little CD-player (named PRINCE), a derivative 50W power amplifier (named DWARF-II) and some new modules for the pre amplifier DIALOG. Wojciech Pacuła: Do you remember your first High End show by High End Society? Armin Krauss: The first HIGH END shows where I personally attended in association with Avantgarde Acoustic was indeed in Frankfurt, 1996. AK: The demo speakers were DUOs, and this was also the year where we displayed the first prototypes of the UNO. AK: The quality of the parts, and our manufacturing process has very much professionalized since then, and with the much better build quality, the sound as well constantly improved over the years. WP: How do you feel about 30th Anniversary - what kind of show it is, what people, brands etc. AK: In recent years, the HIGH END show became THE most important show around the globe! It is a fantastic "meeting spot" for business people, and a wonderful "shop window" for our industry, giving a very professional and representative picture of our industry to the public. So we feel that the HIGH END and its organizers deserve every respect, and it is good to see that the show gained such a highly reputed status during the past 30 years. AK: There certainly happened a lot of technological changes, and not only (but most obviously) on the digital side. But for us the biggest change - doubtlessly triggered by the internet - has been the way how we communicate with our customers today. So for us as a manufacturer it is of increasing importance how our customers perceive us as an engineering, innovating and high-quality-manufacturing company. And we have totally new opportunities to make people understand what we are doing, and what the products will do for them. AK: We'll step into the next generation of specially designed amplifiers for our speakers. The approach we started with MODEL THREE will be taken to the next level with the upcoming amplifier line, and we'll demo the line preamp and stereo-poweramp of this new line. Sorry, but further details will be kept secret until the show! WP: What is the most significant technology change last years? AK: In our products the OMEGA (high impedance voice coils) and CPC (capacitor biassing) are significant steps towards a truly faithful music reproduction. Looking at the whole industry, we think that the appearance of digital high resolution files has the potential to revolutionize the possibilities of high end audio. Fortunately for us, this will make people aware of the importance of excellent loudspeakers, because there will be much more to hear (in terms of resolution, dynamics etc.)! Wojciech Pacuła: Do you remember your first High End show? What product did you show there? 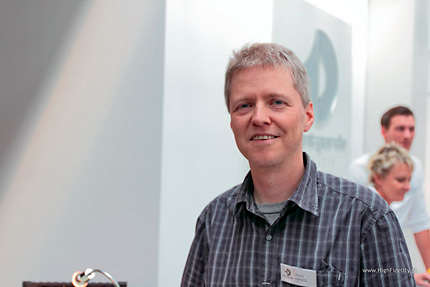 Graeme Coley: Furutech first took its products to the Frankfurt show in 2003. 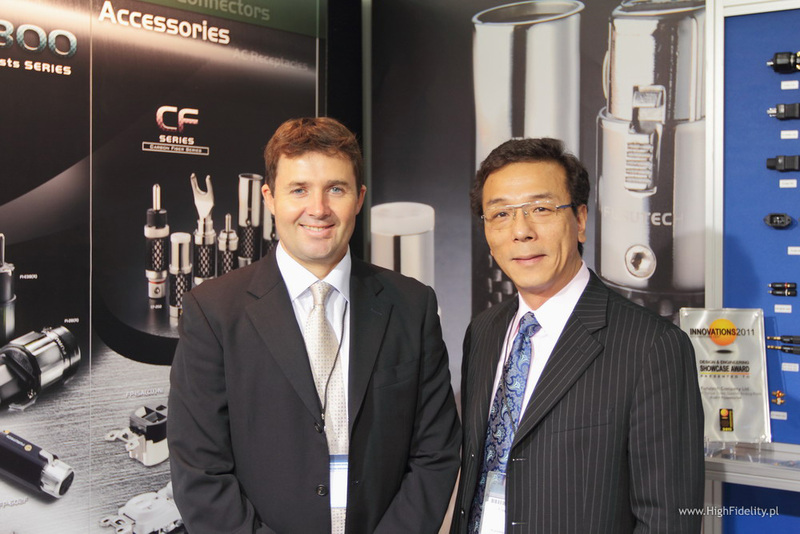 Over a number years prior to their participation in the Frankfurt show, Furutech had established a loyal following of high-end enthusiasts in Europe and their call for Furutech to develop the world’s first true high-end schuko products was heard. 2002 was spent developing these products for unveiling at the 2003 show, and hard work paid off with an overwhelming response to Furutech’s craftsmanship and product performance. In Europe, Furutech has not look back since, year after year debuting the finest AC connectors for the European high-end market. Products first introduced in 2003 are as follows: FI-E30 schuko socket, FI-E35 high-end performance schuko connector, FI-E11 high performance schuko connector and power distribution units e-TP60E and e-TP80E. Furutech kept up the momentum in 2004, introducing a high-end AC mains connector for the UK, industry benchmark FI-UK1363 series and high-end HDMI cables. GC: The Furutech range of high-end performance audio products has increased from around 50 items, at that time, to over 200 items and counting. Furutech has increased the variety of products it now manufactures to include a world class line-up of analog products, analog treatments, OEM parts and now under the ADL (Alpha Design Labs) brand, Furutech is looking to greatly expand its reach with the introduction of this new entry-level line. ADL was created by Furutech to imbue its Pure Transmission Technology into carefully engineered innovative designs that everyone can afford. 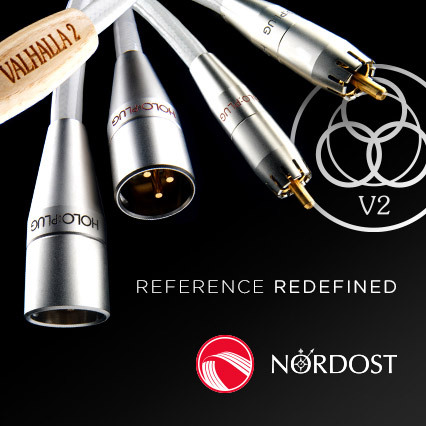 ADL digital components and cables are made with the same dedication to total resonance control and refinement as all of Furutech's many cables and accessories. The Furutech range now covers the majority of accessories need to take your system to the next level, including the following: high performance 15A and 20A A/V cable and power connectors and parts, as well as distribution/filtering products including the 120Hz standard xv1.3 HDMI cable, GT2 USB 2.0 cables, Ag-12 Silver Phono Cable, The Silver Arrows Phono Cable, La Source Headshell Wires, Monza LP Stabilizer Weight, the Top-of-the-line Flux Cable series and entry level Evolution II series, Pure Power 6, e-TP4+4, e-TP609, e-TP615 and e-TP60 Power Distributors, and e-TP80 Power Filters, deMag Disc and Cable Demagnetizer, PC-2 Disc Pure Cleaner, and their own very special NANO Liquid Contact Enhancer, plus even more fine cable and OEM products. GC: It has certainly become a world of two halves. The two international shows of consequence are CES Las Vegas and High End Society Munich. Those in the industry who don’t visit CES are sure to visit the High End Society, and for companies with global distribution networks like Furutech, it has become essential to exhibit at both. 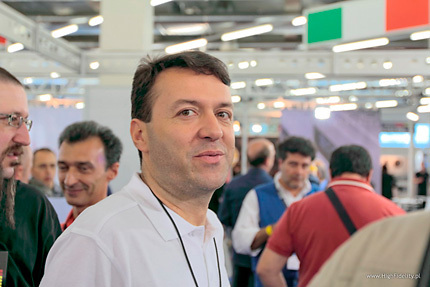 As a manufacturer we have a responsibility to our customers to have a presence at these shows, not only to debut new products and the obligatory promotional purposes, but more importantly to meet face-to-face and come together as friends. That is the beauty of a small industry like the high-end industry, while very specialized, it remains personal and friendly, and the Munich show certainly encourages this atmosphere. "High Fidelity OnLine" is an internet magazine, published since may 2004, devoted to high quality reproduction of sound and picture. It is a monthly magazine, but the articles are uploaded twice a month - in the beginning of the month and in the middle. The news column is updated on on-going basis, if possible. The main sections are: "Tests", "Events" (interviews, reportages, and similar), "Hyde Park" (user tests, opinions) and "Who asks..." (readers questions and HFOL answers). Articles from earlier issues can be read in the "Archive". Have a nice read!